Golden Pansy and Golden Pansy in Reverse, Zabkowice. Also known as Eureka Cross and Southern Cross. ​Our research has proved the origin of Golden Pansy to have been Zabkowice. Earlier speculation, based on the location of where it was found, and as reported in some books, suggested that they had been made in Australia. This explains the other names for this pattern: “Southern Cross” and “Eureka Cross” (a historical Australian flag). ​Following the discovery of various catalogues, the maker of Golden Pansy is now established as Zabkowice. 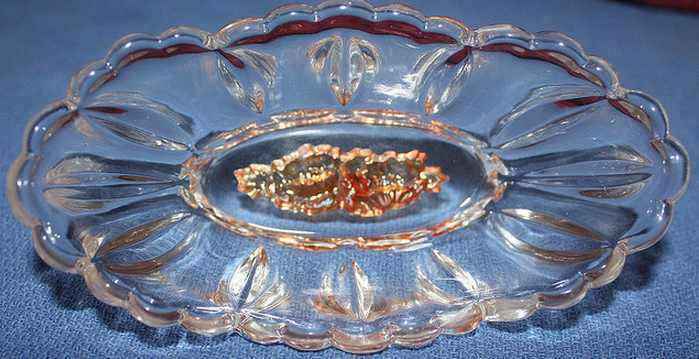 Golden Pansy is known in a variety of shapes including 8" and 5" bowls, plates (including 11.25" chop plate), low oval dishes, large 10” rectangular tray and pin tray. The configuration of the pansy motifs varies on the different shapes. 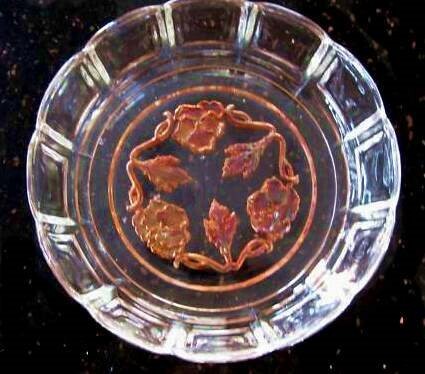 Most examples feature the intaglio golden design on the base, with the rest of the glass clear (although pale pink base glass is also reported). Golden Pansy and Leaves, Zabkowice. ​The pattern configuration alters according to the size of the bowl. The large bowl (immediate right) has a circle of three pansies, the mid-size has an upright bunch of three pansies while the small bowl (far right) has just a single pansy. Golden Pineapple, Zabkowice. Also known as Golden Pineapple and Blackberries. This pattern has the same encircling design as Golden Blackberry, and shares design similarities in the fruits. The distinguishing feature of this pattern is the large pineapple. and small bowls, as well as a 7" plate. Golden Poppies and Variant, Zabkowice. Large and small bowls and plates are known. Note how the poppy design changes on the three different sizes, as shown in the 1928 catalogue illustration, below. ​A similar (but not exactly the same) double poppy motif is also known on Ring-Around pieces: a small 5 inch oval dish has been found with this pattern variation, and is shown below, right, called Golden Poppies Variant. ​* Jerry and Carol Curtis have a wonderful flikr gallery devoted to Carnival Glass Miniatures and Novelties.